About 2 years ago, I decided that it would be a good idea to log how much electricity I was using. If the endeavor resulted into an internet connected device, that would be even better. So I set out looking for an energy meter. 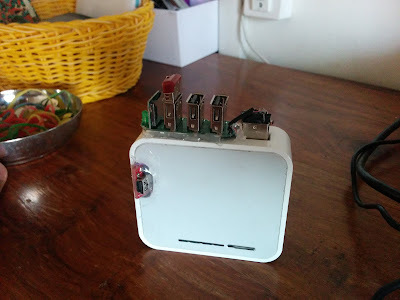 I was looking for one which had an interface which would all me to connect it to the computer (or Raspberry Pi or an OpenWrt device). Since I have 3 phase supply coming into my house. There are 5 wires coming into my main electrical distribution panel: Red, Yellow, Blue, Neutral and Earth. The RMS voltage between any one of the 3 live wires and neutral is 230 volts. 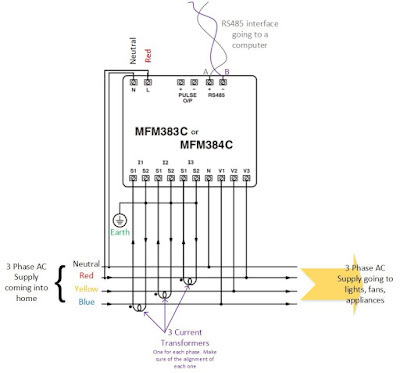 I selected the Selec MFM383C which is a 3 phase meter with Modbus interface. I also used 3 nos. current transformers: Selec SPCT-62/40-100/5-1.5(1T)-0.5 one each for each phase line (Red, Yellow and Blue). These transformers are of the ratio 100:5. The connection scheme is as shown below. One has to take care to make sure the direction of wire passing through the current transformer and the order of connection of terminals of current transformers is consistent across all three phases. My house's main electrical distribution panel. You can see that the various phases have been routed to different category of equipment. The Red goes to Lights and Fans. The Yellow one goes to the kitchen - Washing Machine, Microwave and Fridge and to Air Conditioning. The Blue one powers the 3 water heaters in the three bathrooms. I printed out the labels and a layout of my apartment to map the switches to the various electrical outlets for easy fault finding and isolation. The main protection device is an RCCB on the top left. There are MCBs for each rooms/ high power appliance. Here are the detailed photos of front and back side of Select MFM383C. Red, Blue and Yellow pass through each of the current transformer. 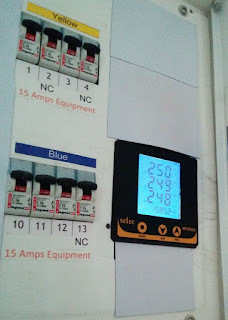 Finally I used the following to read the Modbus registers from the energy meter. 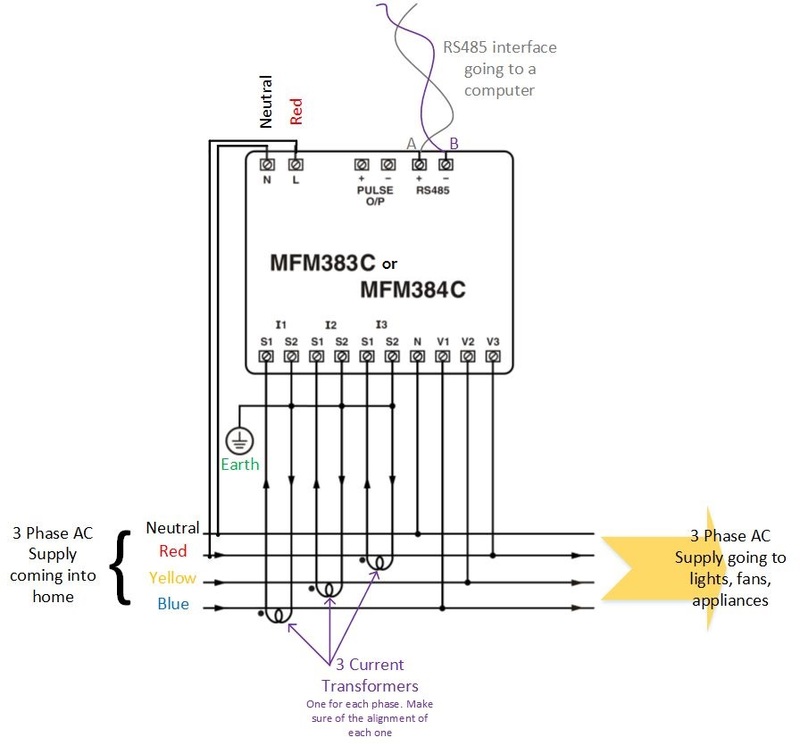 Please note that the newer model MFM384C is similar in operation (and connection) to MFM383C but there is difference in the memory organization (addresses) of the various Modbus registers between the two.